Before I go any further, for all you purists… you might say this is isn’t truly paella and that it is Arroz Al Horno (an argument I often have with some of my Spanish friends and family)- even though I would argue it isn’t! I do start on the stove after all, I just make it much easier on myself and drop it in the oven to finish it. This has the added benefit of being able to cook without me having to watch over it all the time – something I think many of you would appreciate. To further support my argument, the Guardian published a fabulous article which I was quite surprised supported much of what I already knew about making paella! Arroz al horno is also cooked in a round glazed earthenware dish (which I also happen to have, and I also make from time to time)and it contains a selection of different cuts of meat, usually one of each – Chorizo, blood sausage, a strip of belly pork, among others. The principal might be similar but I think they are still different. Besides, if you are going to be a purist about the making of paella, then you really need find yourself some lovely wood from an orange tree and use this to start-up a fire to cook this on. This is way to much hassle for me most of the time. One thing I have learned about paella, no one seems to do it the same way. My father comes from the region, Valencia, and I lived there for a while and would visit fairly often once I moved away (before kids of course). I have been to paellas festivals where there are several groups of people gather around different fires making their paellas, arguing about whose way is right, and whose grandmother’s way of doing it was the right way. So, this is my family’s way. Truth be told, even though my father painstakingly taught me how to make this, it has evolved over many years of making it without his guidance and I am sure barely resembles what he makes. 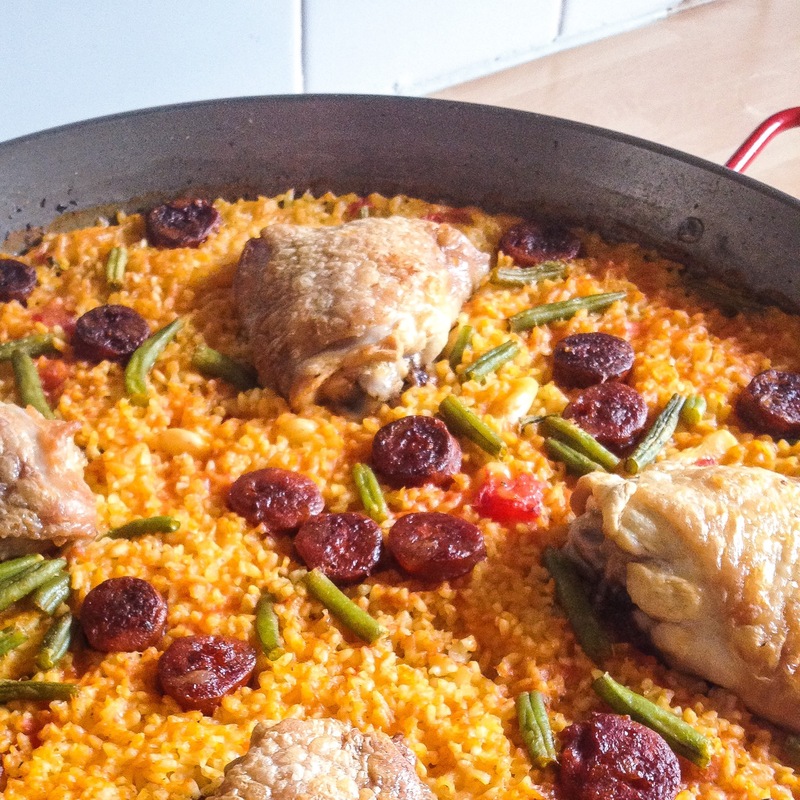 I am find I am always apologising in the UK for making a paella without seafood – either that or fending off concerned guests with a seafood allergy! Weirdly, I have had very few paellas with seafood in my life. Paella didn’t start out with fish. Traditionally, it began with chicken, rabbit and snails. Now, I have struggled to obtain decent rabbit in the UK, which is why I gave up on it eventually. So now I just use more chicken. As for the snails… Well, although the snails from our garden are massive, I just don’t have the faith in my ability to lock them into a mesh box and wait it out until they are okay to cook. I am partly squeamish about this process and, even though I believe we should know where our food comes from and how it is prepared (and I support a predominantly plant-based diet, which means we don’t eat meat all that often), I find on the rare occasion in which I do have snails, that they be prepared by an expert. So, no snails either. I tend to keep the dish quite simple, and not overload with too many ingredients. But this is how I grew up with the dish. It is also how I find a lot of traditional Spanish dishes. It helps that the ingredients in Spain are usually intensely full of flavour. So keeping the dishes simple means you can really enjoy the amazing flavours they bring to the dish. Sadly, those same ingredients usually need a bit more help here in the UK. So feel free to enhance this dish for your needs. Before I begin, the most crucial thing to look at is the size of your oven and the size of your dish. I have been caught out a few times. Sometimes just turning the wire oven rack around has helped me out in a pinch! Otherwise, the gas hob and careful turning and movement can help you cook it on the hob if you get stuck. Let me also caveat the measurements – these will need to be adjusted to your dish. If you don’t know the size of your dish then I suggest using a measuring cup of water, adding one cup at a time until you are near the top (leave at least 1 cm, if not more from the top). This should give you the amount of stock and rice you can add and decide the number of people you can feed with your dish. Use this as a guide for adapting your dish as you need to. Add the saffron threads and rosemary to the hot chicken stock. Set aside. Place your paella dish over the gas hob and heat slowly over med-low heat. Once the dish is hot, add a little olive oil and increase the heat to med-high. Once the oil has warmed, place the meat, skin side down on the pan and sear it on both sides. The meat should release naturally once it has seared, without having to scrape it off the pan. When the meat has finished browning, transfer to a shallow dish and set aside. 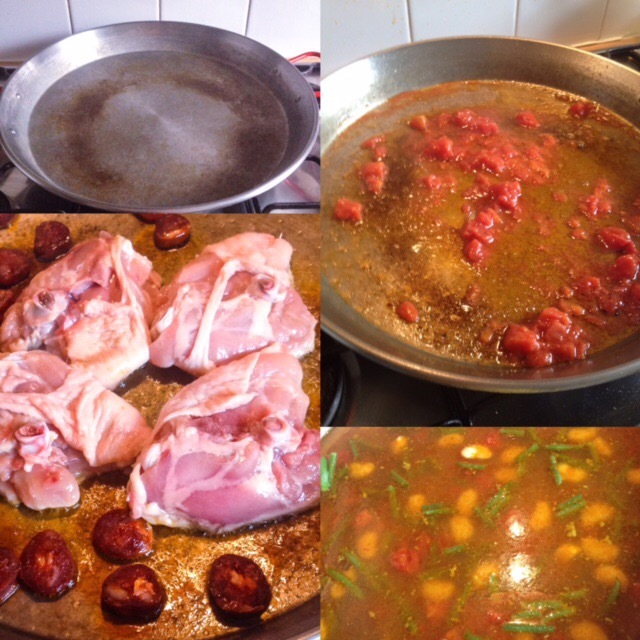 Complete the same with the chorizo, if using, and transfer the browned sausage to the same dish as the chicken. Using the same oil in the paella dish, turn the heat down a little then add the chopped garlic and saute for a few minutes before adding the chopped tomato. Allow the chopped tomato to reduce down by half. It should change over, producing a sheen on top, as it cooks with the olive oil. If you are using the smoked paprika, add this to the dish now. Next, add the pieces of meat around the dish. They should be evenly spread about with a dotting of the chorizo around. Carefully, transfer the paella dish to the oven and leave it for 20 minutes. After this time, check on the dish to make sure there is still quite a bit of liquid and turn the paella dish around 1/4 turn, to finish cooking for another 20 minutes. Double check after 15 minutes to make sure the liquid has not yet run out and to test the rice. The grains should be soft and there should be no more liquid left in the bottom of the dish, when it is finished cooking. When the paella is finished cooking. Remove it from the oven and leave it to rest for 10 minutes before serving. When serving, it is customary to place this in the centre of the table, and each person is allocated a wedge of the dish for themselves, usually the one closest to them. Provide a plate for each person and allow them to serve themselves, putting anything they do not want into the middle – this is fair game for anyone else to take! This dish is best served with alioli, a chunk of fresh bread and some red wine from the Utiel-Requena region (Valencia). If you do happen to have some leftover, I recommend frying the leftovers with a little oil to heat through the next day, and not heating in the microwave. It tastes infinitely better!